The study of bow designs, trigger mechanisms and spanning devices reveals a tale of considerable mechanical ingenuity; advances that produced a battlefield weapon requiring comparatively little training to use. It was an extremely useful weapon, and especially effective in siege warfare for both attack and defence. Known to the Ancient Greeks and the Chinese as early as the 5th century BC, the crossbow developed both in Western Europe and in the Far East. Advances in trigger mechanisms, spanning and bow design allowed the development of ever more powerful bows. 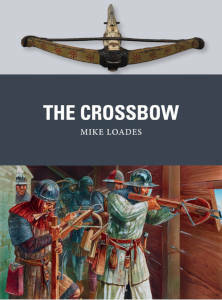 In this study Mike Loades traces the origins, development and combat record of the crossbow up to the end of its life as a mainstream battlefield weapon in the early 16th century. It was a formidable projectile weapon that played a key role in a host of battles and sieges across Europe and Asia.